The purpose of this newsletter is to help the Writing.com author hone their craft and improve their skills. Along with that I would like to inform, advocate, and create new, fresh ideas for the author. Write to me if you have an idea you would like presented. Action! Adventure! Nah, too tired. We all love to write action and move our story along, don't we? But life isn't quite as exciting every minute. So what do we do to slow things down? Weather is a possibility, a rainstorm could trap your characters indoors, or the heat could make it hard for characters to be active. Emotions like sadness can slow us down, and things like fear freezing us in place, or shock stiffening your character's spine. Real physical challenges can hamper progress. Whether it's a handicap or pants around their ankles, things can slow our characters down. Clearly you don't want to bore your reader but if you want to slow things down to set up the next peak in the story arc, think about what your method of change will be. Rising action has to come from somewhere so let it be from an interesting yet slow part of your story. And as always, Write On! 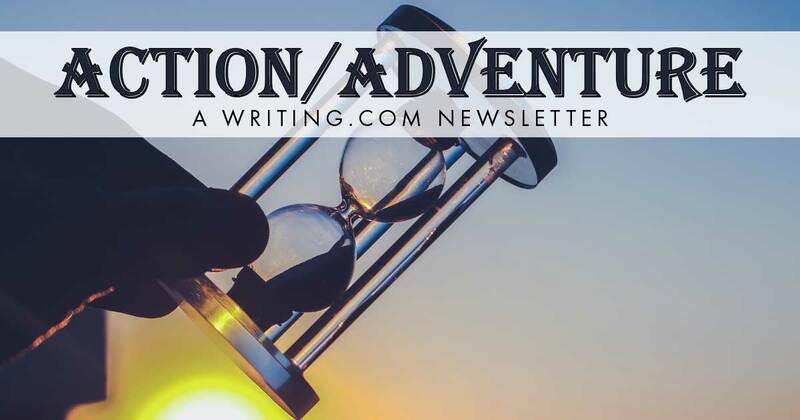 This month's question: How do you slow your story pace? Answer below Editors love feedback! I hope this letter finds you well, my dear friend. I have recently made the most remarkable discovery. It may shed some light on the mysterious devastation of Warwickshire County in 1789, perhaps what occurred there was not entirely the result of infectious disease as you have so often maintained. The discovery in question has led me to doubt many of my previous convictions as to the nature of our world, especially the absoluteness of its' physical laws. My once firm resolve that no supernatural or occult forces exist has definitely been undermined, to say the least. Thus, have I acquired a new found respect for what I and others, have often characterized as your “impractical scholarly pursuits,” please do, forgive me. A supernatural being tells another of his secret duty to mankind. Excerpt: I have asked my Lord why they don’t shoulder this burden. He said to me that their job is to deal with the fallen angels. I was also told the Nepheseers are on a lower spiritual plain. I appear as a man. And I occupy the office of a deacon at a church. Excerpt: …a rat comes out of a hole in the corner, runs across the cold concrete floor, then stops. Alan Peterson is glad to see it. He hasn’t seen the rat for a while. To him the rat means companionship. It means it’s still alive. Excerpt: “So refreshing these gals from the antipodes you know!” A woman said, sounding as if she had a plum in her mouth. “Yes, Penelope Smythe-Jones has an Australian nanny she says she’s an absolute Godsend,” her friend replied. Kylie didn’t expect to be working as a waitress for long. Having recently arrived in London from Sydney with a scheme in mind. She intended getting a job as a nanny with a rich family and if everything went as she planned she’d snare herself a wealthy man who would marry her and give her the lifestyle she deserved. It all sounded so simple. Candy glanced at Richard, wiggled his nose, and oinked. The teacup piglet snorted and buried his snoot in a bowl of oats. A maid on a journey with her master's murderer. First short story I've ever written. Excerpt: She was cold. The night was cold and the wind passing through the valley they'd camped at felt like a thousand sharp needles attacking whatever exposed bit of skin it could find. She curled up as tightly as she could under the thin blanket Master had given her, but it did nothing to alleviate the cold. They had travelled so far from home. She didn't know which part of Asatia they were in, though Master Rick seemed to know his way around and constantly consulted a map, which was meaningless to her. She felt numb, the incident days ago still replaying through her mind. Dramatic Music App Plus for Apple iOS, Android or Kindle Fire. Last month's question: Do you use common problems like lost keys to create a twist in your stories? How did you use that in your writing?? Paul replied: I’ve used forgetfulness several times. I write a lot of dialog, I love dialog, and the frustration of trying to remember where the keys (or whatever) are can become a 3 Stooges routine in just a couple lines of dialog. And you get to scream the frustration if you need to. Thank you for your post and sharing your ideas with us. I appreciate it. Editing is BLUE sent: This story was written years ago for a Dialogue Only contest. I expanded it a bit and it was published in an anthology picked from a blind submission. It deals with the loss of memory with a surprising revelation. When dementia loosens the tongue, the truth will come out. Generated in 1.21 seconds at 12:12am on Apr 24, 2019 via server WWW2.